In contrast to last weekend away, this one, also delightful, was spent at home. 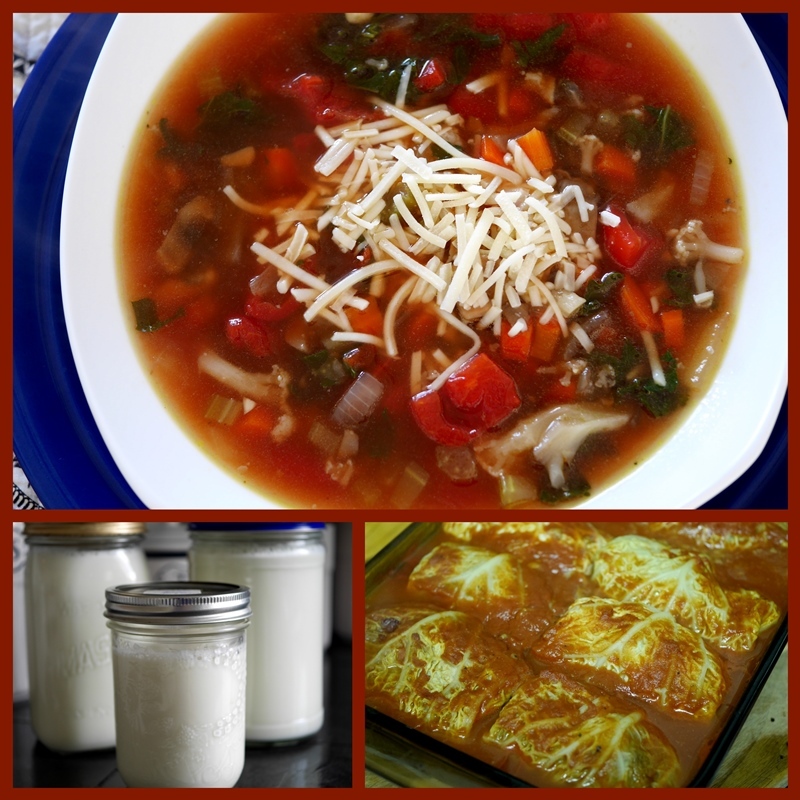 I puttered in the kitchen on Saturday, making vegetable soup, yogurt, and cabbage rolls. Making yogurt is a new thing for me. I've been trying to minimize the plastic in our home; making yogurt eliminates a big tub every week. I use the oven light in my electric oven and it works so well and is so easy that I wish I'd started long ago. Chillier than normal temperatures persist and many pots of tea have been brewed. A jar of honey and a bowl of teabags is handy on the counter top, and a vase full of daffodils is a cheery sight. I'm realizing now the stress of an extremely challenging class last semester. My current classes are delightful and I come home with enough energy in the evenings to do something other than collapse. I'm sleeping better, too. Stress is an insidious drain on an individual's well-being. We missed the snowfall that blanketed much of our province over the weekend. Instead, a chill wind blew, but Spring's imminent arrival is evident in fresh green shoots on various shrubs, and in the appearance of sharply pointed tulip, hyacinth, and daffodil bulbs in the garden. Each month of the year has it's own particular charm, warming meals and bright flowers is a wonderful description of February. Your final photo is stunning! Glad to hear that school life is less stressful this semester and that you are able to enjoy life more as a result. Wishing you a fab week ahead & Happy Mosaic Monday. Glad to hear that your class is less stressful this term, long may that last. Those cabbage rolls look tasty. your meals look so good. I have never made cabbage rolls but I think, I might try it in the future. I love your photographs, they are amazing. I am glad you had a nice stay at home weekend, Lorrie. I used to make yogurt way back in the 70s when yogurt makers were a big thing. My hubby used to love cabbage rolls but can't eat much of anything anymore. I remember those days! When I was a "classroom teacher", I used to think about the problems of students every night. it was in the beginning of my career and I was taking library courses in the evening, tutoring and being a single parent to a teenager. Now, I look back and wonder how I survived. true that one bad apple spoils the whole barrel? I would be really interested to know how you make your yogurt Lorrie! Glad to learn that your current class are delightful and allow you to have a more relaxed time especially on your return home in the evenings. I hope you are inviting us all over for left overs, it all looks delicious. It's been so long since I've had cabbage rolls and those look so good I think I might just have to make them. Thank you! What a good combination--cabbage rolls and soup. I have never made them but should try. I remember hating them when a child but now they sound delicious. I'm glad your classes are less stressful this semester. I'm loving your pretty tea station! Tea is one of my favourite ways of de-stressing. I’m so glad that you don’t have the stresses that you did last semester! Looks like a delightful weekend, and I love the peeks of spring! I'm been feeling a lot of stress lately...maybe that's why I've been so tired. I thought it might be the pollen we already have. Your soup looks good and the yogurt will be so healthy. Hugs! Hi Lorrie, it sounds like a wonderful weekend at home. I love your tea pot display and the daffodils just brighten everything. The tea pot is very pretty. Hubby is making dinner right now, but I'm pretty hungry ... so your food pictures have me salivating all the more! The daffodils are such a cheerful bud with their bright little faces! Glad you got relief from some stress - when I was working, I used to experience lower back pain, and I now realize it was all anxiety! That's nice that your classes this term are less stressful from last. That looks like some good energy expended in your kitchen! Have a good week. your soup looks wonderful. This is one of the joys of winter. I've never tried making yoghurt. I hope you have a stressless week. Looking 'springy' on your post Lorrie - glad the snowfall missed your area. Years ago made my own yogurt too, and I guess I should do it again. I've been enjoying the latest addition to the ever enlarging choice in store bought yogurts, and it's originally from Montreal but now made in the USA in think (boo hoo!). It's called Liberté - organic/whole milk -so not lo-cal, but oh so delicious! Faves so far are Philippine Coconut and Baja Strawberry. Envy your daffodils -- Like NanaDiana above, I too used to have a yogurt maker way back when -- but we've moved a couple of times since then. Now we have one of those faddish Instant Pots which is supposed to do everything but wash the dishes -- Yogurt making included. I've been thinking about it. Your words may have provided the necessary incentive (less plastic) ... and also it looks good! Lorrie, I always enjoy your photos. You look at things from a different perspective. The photo of the shoot is intriguing! I'm glad you are feeling less stressed. I think you not only delight in everyday beauty but in life generally. How pretty your photos are. Long may you be able to enjoy yourself in this so very important yet so modest way of life. I've been wanting to try my hand at yogurt for a while now. Not sure why I haven't.